Hello! My name is Jordan and I am from Washington, D.C. I am going on the school-led senior project to Heritage Academy in Ghana. I will be teaching English and Creative Writing to 6th grade students as well as immersing myself in the Ghanian culture and traditions. I can't wait to be on the other side of the world! Wow. As I am writing this I am lying on my mattress on the floor, listening to music and eating plantain chips. Our group had a meeting about transitioning last night and my head has been spinning ever since. I can’t believe that the downhill of my senior project has begun. It feels like I have been here for months, but at the same time, I feel like I could stay here forever. The simplicity of life here is going to be impossible to forget. I have come to love when the power randomly goes out and when a soccer ball or uniform is somebody’s most prized possession. I am going to miss relying on only my feet for transportation, and not having to worry about what I look like to other people. I feel comfortable here, like there is always somebody looking out for me, just because I am a human being. I love being forced to say “hi” to every person I pass on the street, or hearing cars honk as I walk to school, just because people are so friendly. I will miss being called “obroni” even though I hate it. I will miss being able to buy Fanta in a reused soda bottle for $0.40 or a loaf of bread for $0.80. I’m going to miss being expected to do service every afternoon, no matter how hot it is outside. But most of all, I will miss the kids. Even if some of them can get on my nerves, I feel so much compassion for them. I can’t imagine what it would be like to be born here, into a family of who knows how many people, and be expected to fight my way out of poverty. Through all of their struggles, I still see their smiling faces getting off the bus in the morning, see the accomplishment in their eyes when they finish reading a page of a book, or their gigantic smiles when they get a 100% mark. They are so dedicated to education. To getting out and making a life for themselves. I will never look at a student the same way again. I now know what commitment to school really looks like. It means waking up at the crack of dawn to walk to your bus stop, it means shouting “keep quiet” every five seconds to be able to hear what your teacher is saying, or spending $75 (possibly all you have) a year for your education. One of the group members brought something up that has stuck with me. I will never be able to look at anything that costs $75 again without thinking about what a year’s education could do for a child. There is no better way to spend your money. Empowering a child with knowledge is unbeatable. With my yearly tuition at Westtown, I could pay for the tuitions of more than 600 students at Heritage Academy. I will never look at my belongings the same way. I will never take what I have for granted again. I know that I will feel sick when I come home to a room full of things I don’t need, with a fancy mattress and a closet full of clothing and shoes. I will never again think that I don’t have enough. If I have clothes on my back, a roof to sleep under, and an education, I have more than enough to live a good life. I will never forget this experience. A life-changing experience is an understatement of my time here. I plan to change many lives with the experience I have gained here. My life has changed forever. All because of the smiles I see on the kids faces every day. Yesterday our group went on another outing. We spent our morning at Kakum National Park, and our afternoon visiting another slave castle and shopping. Kakum was awesome. One of its features is a series of canopy rope walks over the forest. The height of the 8 suspension bridges began at 10 meters but the highest one was 40 meters above the forest floor. Of course, some of the group decided to freak the others out by jumping up and down, shaking the entire bridge, and getting screams out of some of the members of our group. It was pretty walking over the forest. We didn’t see many animals, but we did see what the guide told us was a green viper hanging from a tree branch on the way up the mountain. We ate peanut butter and jelly for lunch in the picnic area, and packed into the van for the drive to the slave castle. The slave castle was pretty much the same as the one before, just 200 years younger. After listening to a monotone voice for 45 minutes, we got to shop. Heather and I were on a mission to find backpacks and a Ghanaian flag. Luckily, we were successful and many of you will see me sporting my backpack at school. I spent the night hanging out with the four Emmanuels, Bright and Godsway (some of the high schoolers) Overall, it was a good day. Now for a long day at the beach…. It’s been a crazy few days. Our schedules are almost as packed as they are at Westtown. We go from reading periods to classes to home to service to home again. I couldn’t be more exhausted. On the other hand, I am having such a good time. I feel like I’m really making the most of my time here. I’ve gotten to know some of the kids pretty well and I can’t think about leaving here and not being able to see them every day. 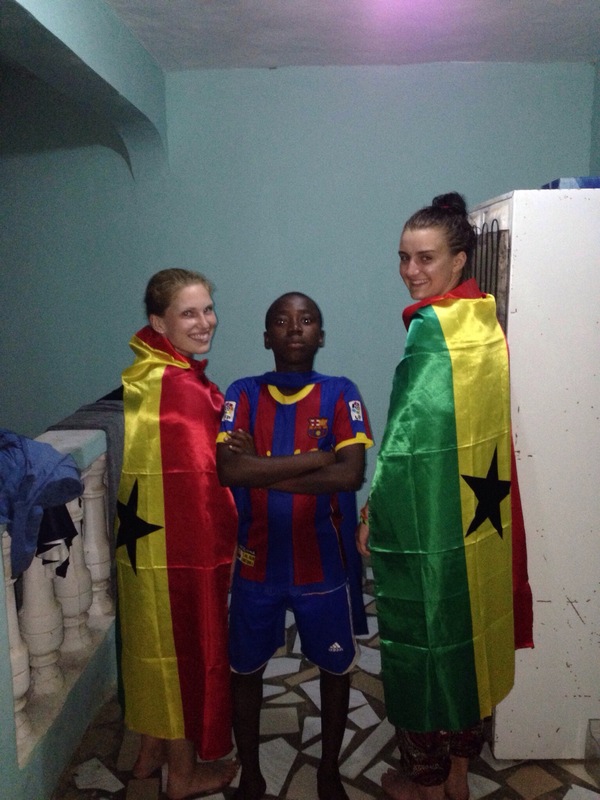 I think that another visit to Ghana will have to be in my future.. Hopefully my parents won’t mind… Mom and Dad? We went to the market again yesterday, and spent our time walking around observing the lives of the shop-keepers and children selling small things from their heads. The highlight of the visit to the market was when Heather and I spotted a woman selling plantain chips. We bought two bags to start with, then ended up calling the woman to the van’s window to buy five more bags. When all the other people selling things saw that we were buying the plantain chips, they surrounded the car. Within all of these people was a boy who thought that a marriage proposal was necessary, but my friend shut that down fairly quickly. Teaching was pretty hard today. Keeping the younger kids quiet is a full-time job in itself. I had to pull one of the kids out from his seat and sit him in a corner in the front of the room. Hopefully it will be a bit easier tomorrow. I woke up at 7 after a long night hanging out with the people on the trip. Needless to say I was tired, but I was so excited for the day. It was beach day. We piled into the van, broke out our bracelet making materials and cameras, and started the bumpy hour and a half long drive. The first thing on our agenda was visting an old slave castle (old as in over 500 years old). As we got out of the van men rushed us, asking where we were from and our names. Luckily our group leader had warned us about these men. They ask you for your name and when you come back from visiting the castle they hand you a shell with your name written (in sharpie) on them and demand money. The slave castle was beautiful while being extremely depressing. There were however multiple gift shops along the tour to brighten the mood. After seeing increbile views of the ocean we were finally done with the tour and dumped in front of several small shops. The women sang to us to come inside, desperate for us to look around. I brought a few souvenirs to bring back home. Some members of the group scored knives and paintings, but I kept it simple. We left the slave castle and started the drive to a beach resort. When we got there we went straight to a table and ordered lunch. It was a perfect scene. We ate looking out over the ocean and palm trees surrounded our cabana. After waiting quite a while, we got out food and fresh pineapple juice. After lunch, we hit the pool and free wifi. It couldn’t have gotten better, but it did. When we were finished the pool we headed to the beach, towels and sunglasses in hand. We picked our spot and “tanned” for th next few hours. Most of us ended up falling asleep and didn’t rotate properly. We walked down to the water and let the waves hit our ankles. The water was the perfect temperature. Our time at the beach came to a close so we changed back into our clothes and walked back to the van. The ride home was exciting. Our driver sped through the small towns, just missing the pedestrians. When we hit traffic, he drove in the wrong lane until an approaching car started coming towards us. Much to our surprise, instead of trying to get back in the proper lane, he moved to the shoulder. Finally he decided to take a shortcut, but once we came back to the main road, there was more traffic. We got to it’s source: a funeral. Funerls are a little but different here. Instead of a somber service, they throw a party featuring loud music and teenagers lighting aerosol on fire. When we got past the funeral we kept driving. Right into a storm. The sky got incredibly dark and the driver sped up, trying to beat the rain, ignoring the numerous potholes in the road. By this time, our sunburns had set in, and many of us were talking about how much pain we’d be in tomorrow. I sat with my arm out the window until a tree branch hit the car and almost decapitated me. The rain started and we closed the windows. When we got home the ten foot dash to the house from the car left most of us soaking wet. We had dinner and hung out for a while. After regaining most of our energy, some of us decided to walk to town to dance and get sodas. When we got there we discovered that dancing day was Friday, so we had our own party. After about an hour we walked back and hung around the house playing games until we went to bed. Church tomorrow! We got to sleep in until 8 this morning because there was no school. I rolled out of bed to find pancakes and delicious eggs waiting for me. After breakfast, we all got dressed and walked over to the marching grounds at the local education university. As we watched the military march, and kind of listers to the speech being made, we felt raindrops. It is currently the dry season here, but this rain cloud just couldn’t hold it in. As the students began to march, the rain came down harder, and the wind blew it into my body. The students continued to march while others ran for cover under trees and small tents. I embraced every second because I finally wasn’t on the verge of sweating just from standing around. When tree branches started falling we saw lightning, and decided to head home. When we got to the house I changed into dry clothes and sat on the porch to watch some of the group play soccer with some of our students. The rain didn’t stop football. Everybody came in for PB and J’s for lunch. The living room was dark (the power was out and the sky was grey) so everybody decided it would be a good time to nap. We all fell asleep at some point somewhere in the house and woke up late I the afternoon. We spent the rest of our time playing card games and speaking with locals. After dinner, we decided to go to town. The rain had finally stopped and there was nothing to do in the powerless house. Bright took us to Jimmycom (a local bar) and we danced outside with very insistent people. Everybody wanted to dance with the white people. In order to keep some of the older men away we lied about having boyfriends, but they taught us some dance moves anyways. After we had enough, we walked back to the house, reflecting on the day as we went. When we got home we settled for watching a tv episode and started a movie. Hopefully we will finish it tomorrow. I woke up to my alarm today. I’m surprised that my phone didn’t die overnight, given that it only had 10% battery when I went to bed. We had pancakes for breakfast; a nice way to start our day. As soon as we got to school I could tell it was going to be a hot day. We all sat in the shade for our first reading period, trying our best to avoid the overwhelming sun. One of the students in my second reading period was surprised to know that I had remembered that today was her birthday, and couldn’t stop smiling for the whole time. Today they asked me to read some for them, and then tried to repeat the way I spoke: like an Obroni. Our first class went very well today. All the kids were in a good mood and seemed to like our introduction to poetry. I was excited about this because I had been a little bit nervous about the lesson plan. It was very difficult to teach because of the constant sound of drumming outside of the classroom. The students were practicing marching for tomorrow, the Ghanaian Independence Day. As soon as it stopped, it was much easier to speak from the front of the classroom. We spent our free period up in the “point breeze”. It’s a small room up in the high school where there is constant wind. I was glad to have the opportunity to cool off after a long morning. Lunch was delicious. We had red red and plantains (my favorite meal so far). The classes that followed went well and I feel like we are getting closer and closer to the kids. However, I still can’t remember all of their names. Still many come up to me telling me that they are the second Jordan they know. Thanks to a friend, most of the kids already knew I was coming. We began our work project after school today. We split into three groups: library, painting and cement block making. I decided to go with the painters group. We were asked to paint one of the future classrooms. We were given a bright green color, watered down of course! My arms soon became tired from reaching as high as I could (I was the tallest in the group). After about an hour, we retired our brushes to some if the heritage high schoolers who had been watching us paint. We decided to walk home opposed to taking a cab. Although it was a challenge for my boot, I enjoyed the fresh air. After dinner and group meeting, I showered and rinsed all the green paint off of my body. We spent the rest of the night making friendship bracelets (the only thing we do to pass the time, thanks to Laura), watching episodes of a crazy tv show (thanks to jack) and sitting underneath the stars. The highlight if my day however was talking to somebody from the US. I’m missing all of my friends and family (and proper running water. Although I find comfort in the simplicity of life here). I am very excited to watch my students march tomorrow, but I think I’m more excited that I get a break from teaching. I have a new sympathy for all of my teachers. Tomorrow I’m going to work on replying to all the students that wrote me notes, and talking my lesson plan through with Erin. Until tomorrow, obronis! I woke up to the laugher of people outside of my bedroom. Luckily, it was cooler today than it was yesterday. I managed to get out of bed and get dressed in five minutes and managed to get a slice of bread for breakfast. I loaded up on sunscreen and opted out of walking to school with most of the other kids in the group (I figured that my boot might not have made it the ten minute walk to school). When we arrived at school we began with two reading periods and snack. Everything went pretty smoothly. By the time class began, many of the kids were practicing marching for March 6th, Ghanaian Independence Day. Each school sends teams of marchers to compete. Apparently heritage academy wins every year. The classes were a little more difficult to keep under control today. The kids seemed to be more hyper than the day before. And much more sassy. When my free period came around, I finally felt like I could take a deep breath. Teaching is much more of a challenge than I though it would be. My last two classes were just as hard as the first. However, games of hangman lightened the mood and kept the majority of the kids interested. Finally it was time for the last reading period, and again I spent it reading with Benjamin. He handed me a letter as if to thank me for spending the time with him. This was my seventh letter so far (most of them just ask for my friendship or to be my pen pal). He had a hard time reading, but we made our way through an entire book. After classes we went to Mankessiem, one of the larger towns near us. The second we stepped of the bus we heard shouts of “obroni” and women shouting random days of the week trying to find the one you were born on to attract your attention. Mine, Wednesday, is Ekua. The outdoor market was full of smells and sights. There were rotting fish sold on the side along with yams and fabric. Our group spent a decent amount of money on fabrics, hoping to get the tailor to turn them into shirts and dresses. We finished our time at the market by buying frozen yogurt which we enjoyed on the van ride back to the house. I really enjoyed the rides to and from the market. It showed so much of the culture. As soon as we returned I took the opportunity to take a cold shower. I felt especially dirty today after the trip to the market and the shower was rejuvenating. We ate dinner and hung out in the living room for the rest of the night. That is until somebody suggested that we all huddle around a computer to watch the Wolf of Wall Street. Bedtime could not come sooner, and hopefully tomorrow morning I will wake up in time for a proper breakfast! Goodmorning Teacher Jordan! Today was my first day teaching and I woke up with anticipation. I was nervous to be in control of 60 students, but as soon as we took the short bus ride to the school my comfort level went up. We walked to the front of the building and met a faculty member. He introduced himself and showed us to our first classroom for a reading session. I sat down with two students, Gift and Comfort, who were eagerly repeating my name. As we read multiple stories I asked them numerous comprehension questions which they answered excitedly. It was then time for snack and chaos ensued. We were tackled by so many kids that I couldn’t keep track of them. I pulled out my camera and started taking pictures. The younger students came running up to the camera yelling “obroni” (foreigner) and asked me to take their pictures, fighting for center stage. I took as many as I could, but when they started grabbing at the camera I put it away. It was time for my first class. Nerves were running through my body as I stepped into my first classroom. Kids were running all over the place, but a few students started asking me questions right away. Before class was supposed to start, one student said “please begin teaching me now” and my excitement grew. I was happy to be teaching somebody who was eager to learn. The students sped through the lesson, taking in every minute while destroying my plans as far as timing went. I grew used to responding to “Madame” as the day went on. When we stopped for our free period I tried to replace all the water that had sweat out of my body. Even though I couldn’t stop sweating, I was glad not to be in the middle of a snow storm. Feeling the heat of the sun was much needed after such a brutal winter. Lunch was delicious. The customary food could not be better. We sat in the shade of the library to eat, but soon were back out on the courtyard spending time with the kids. Many of us had spoken over lunch about the rowdiness of certain classes, and luckily I had them for the two next periods. Once we got them working on the worksheets we brought along, keeping them under control was easy (maybe too easy considering one kid was fast asleep in the back). The last period of the day was the most enjoyable for me. I spent it helping a student, Benjamin, read Dr. Seuss. He occasionally looked to me for help with a word, and cruised through the 60 pages of rhymes. After that period, I was ready for a break. We piled back into the van and headed back to the house. Most of the evening was spent playing cards and making friendships bracelets. Lying in bed has never felt so good. The first day of our Senior Project began with Qdoba, at least for a few of us. We thought of it like our last hurrah. Our last American meal. After our last supper (or lunch), we drove to Westtown where we proceeded to pack our bags, say our goodbyes, and board a school bus. Of course, the bus had some technical difficulties, so we switched buses, along with our thirty some suitcases. We spent four hours on our way to JFK International Airport, managing to see some of the city on our way. As there typically is on a Saturday afternoon, traffic kept us on the road for a little longer than anticipated, so we rushed through the airport to catch our 9:00 flight. Check in and security were a breeze. Other than the fact that my walking boot (I had surgery on my foot a few months ago) had to be tested for explosive material residue. We walked what seemed like miles until finally getting to our gate. Of course by this time it was around 7:30 and we were supposed to board at 8:00. The rush to get food was incredible. Luckily most of us managed to snag a burger and milkshake at Shake Shack. My ticket was scanned, and I was off. All I wanted was to be settled into my seat with nothing but the ocean separating me from Ghana. I had an aslie seat but still my legs couldn’t find anywhere to go. I enjoyed a movie before falling asleep with my heaad on the traytable (this left my classmates in awe). Sleeping on a plane is never easy, and our ten hour flight had quite a bit of turbulence, so my eyes constantly opened and closed. After a few naps and movies, the screen finally showed that there were only 30 minutes of flight time left. I asked for a coffee and glued my eyes to the completely unexciting scene outside of the window. In what seemed like seconds later, we were on the ground in Africa. I was hit by a wall of heat as I left the comfort of the air conditioned plane. We walked across the scathing hot blacktop of the runway to the airport. You could smell the heat. It was everywhere. We waited in line after line and finally reached the front. Right as I walked over to my customs desk, a man touched my arm and asked, “Americans?” I nodded and he smiled and walked away. I guess we stick out like sore thumbs. After collecting all of our bags we headed to the van that would take us from Accra to the Jimmycom guesthouse: our home for the next 18 days. Men surrounded us as soon as we stepped out of the airport, wanting to help us with our bags. We were warned by the group leaders to say no, as they demanded ten dollars continously if they lent a hand. After losing them we stopped for lunch at the beginning of the ride at a very nice hotel. I savored every slice of pizza before we hopped in the van again. The ride was unbearable in every way. No leg space, 17 people crammed into a space hardly meant for 14, and heat. So. Much. Heat. It took us around two hours. Thankfully, we were introduced to the culture as we rode. We saw many people carrying baskets full of merchandise on their heads, pushing it through peoples windows trying to make a few bucks. When we arrived at the Jimmycom guest house, we were pleased to see our beds. We got settled, took showers and ate dinner. It was delicious. We hung out for a while, but after a short group meeting we were pooped. It was bed time. I fell asleep to the sounds of goats and the rustling of the wind in the trees. We were finally here.